The HNC has provided us with some strong playoff competitors, with two of the three final podium places occupied by the Glasgow Hornets and Aberdeen Oilcats in 2016. This division has a history of success, and is finally up to its 6 team quota – let’s have a look at how things are shaping up for 2019! There was no relegation from the HNC Premier Division last year, as the Clyde Comets retained their top flight status with a comfortable win against the Grangemouth Colts. 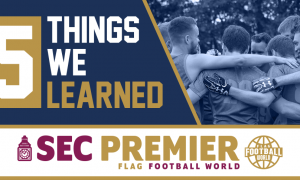 The Glasgow Hornets, Aberdeen Oilcats, Grangemouth Broncos, Edinburgh Outlawns and the aforementioned Comets are joined by Carnegie Flag Football, who were promoted after a perfect regular season in 2018. The season started off with a bang, as the Oilcats and Hornets started perfect, while the Broncos fell off the pace after losing to the Hornets early. The Comets and Outlaws looked like they were destined for a relegation dogfight from the offset, and this proved true throughout the season. In Aberdeen on week two, the Hornets maintained their perfect record with a huge victory over the hosting Oilcats, while the Broncos fell two games behind in the race for the playoffs. Meanwhile, the Outlaws defeated the Comets, 14-13, to take a major step towards survival. 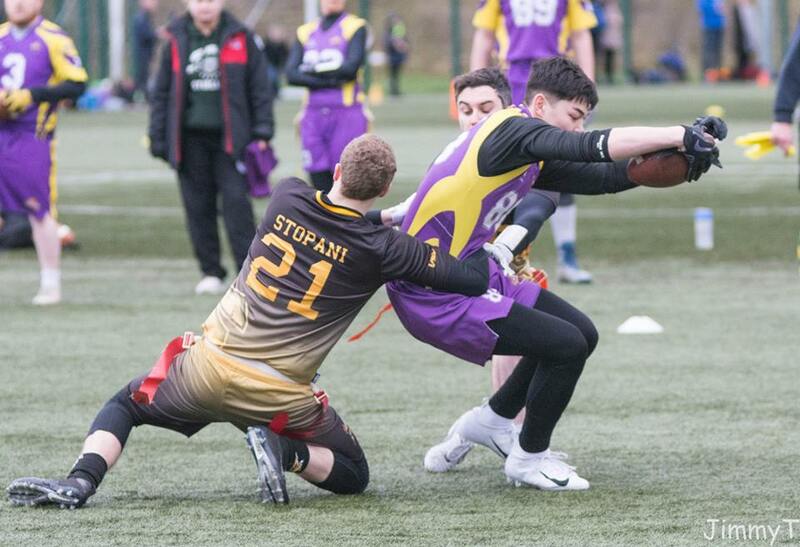 In cross-conference play, the HNC flexed its muscle as the Oilcats, Hornets and Broncos all scored victories over the Manchester Titans, but the Broncos lost further ground by losing to both the Sheffield Giants and Vipers. The Outlaws fared better than the Comets against English opposition, as they matched the wins against the Samurai and Blackhawks, and then went on to beat the Manchester Crows. When the teams resumed play against one another things just got…weird. The Comets had a mini-resurgence, as they shocked everyone by defeating the Aberdeen Oilcats in dramatic fashion. They then lost to the Outlaws on the same day to all but seal their relegation play-off position. Hornets rounded off their perfect season with a smash-and-grab win over the Oilcats, as two Hail Mary throws were the real story of the game. The under-strength Broncos also scalped the Oilcats but then lost to the Outlaws in the final action of the season to round off a campaign to forget. Despite all the upsets, nothing actually changed in the table! That disappointing 8-6 record for the Broncos didn’t stop them from achieving post-season success. They lifted the Plate trophy after an excellent performance with an extremely small squad. 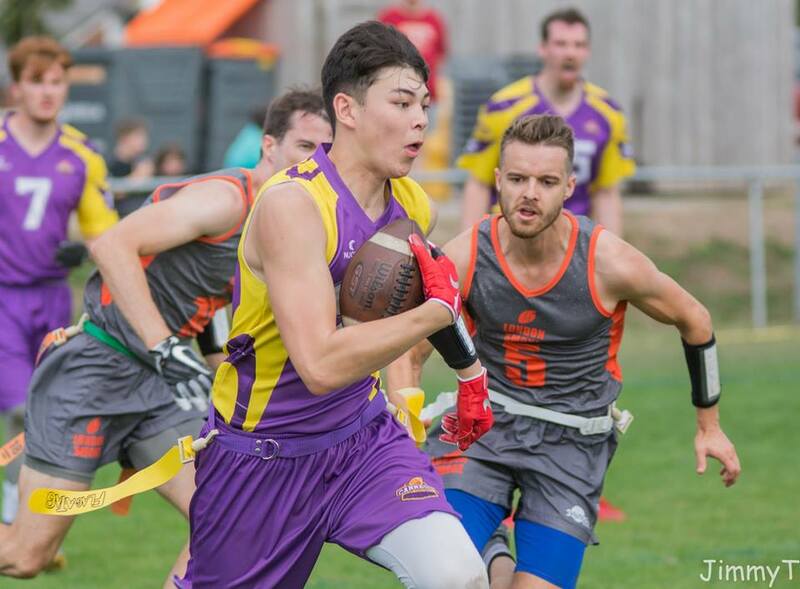 The luck of the draw saw the Oilcats bounced at the first hurdle of the post-season by the Baker Street Buttonhookers, while the Glagsow Hornets fell to the Hookers in the final. 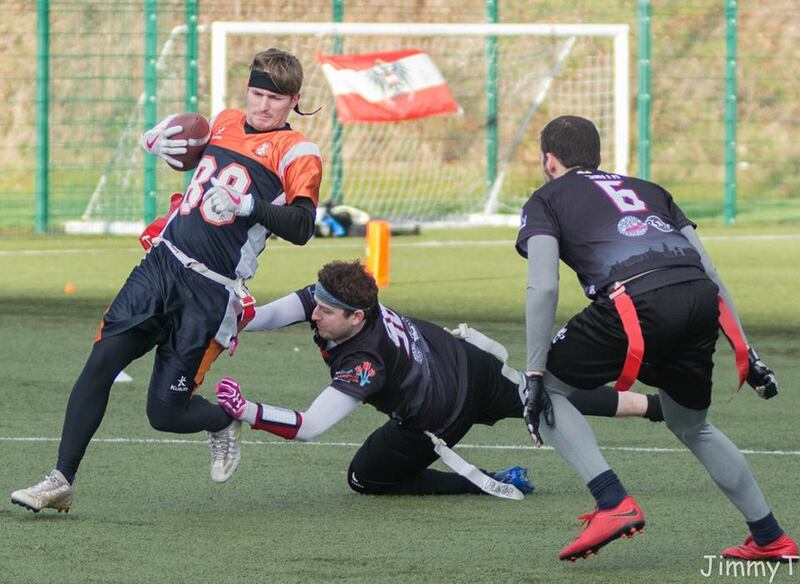 The newly promoted Carnegie ran through Division One, and managed to make the final of their own respective playoffs, but were defeated narrowly by the London Smoke in a wildly entertaining game. There’s a lot to digest from the past 6 months of offseason in the HNC. Starting with the new boys, Carnegie will feel they’re back where they belong. With a strong set of receivers, and plenty of experience, they rode the curtain call for Neil Arnold all the way to an unbelievable level of success that they’d never previously achieved. Calling the HNC Division One a “cake-walk” wouldn’t be doing it justice, as Carnegie were never tested. 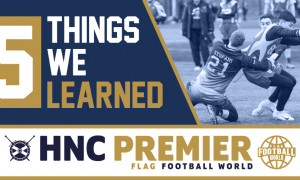 This led us to question their playoff credentials, but they only went and demolished the field there too – a ridiculously lop-sided win over the Merthyr Tydfil Trojans was a particular highlight for the Fife side. Now? They’re without Neil, and they’re facing a much higher level of competition. Stuart Anderson was learning the ropes under Neil, and his progress has shown already in the Winter League. He’s helped by a strong supporting cast, but Stuart might just be able to do enough to keep Carnegie afloat. The Aberdeen Oilcats are looking like the most changed side coming into this season however. They did a fantastic job of reloading a talented roster in the past few seasons, with the additions of Greg Sim, Aaron Drummond, Scott McDonald to name a few. All three players had starring roles last season, and added to an already excellent cast of players. They’ve had to cope with loss however, as the first departure is of resident switchblade Callum Stopani, who has taken his talents to the Glasgow Hornets. Not only is this a huge loss for the Oilcats, but his arrival in Glasgow has directly strengthened a division rival. Following Callum out the door, blitzer extraordinaire and GB Lion, Calum Young has joined up with the Grangemouth Broncos, which again has significantly strengthened a playoff chasing team. 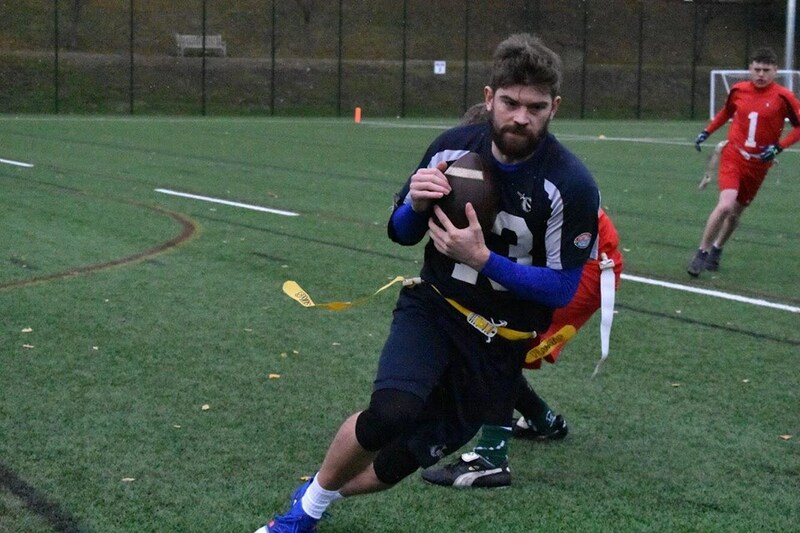 To make matters worse, during the late stages of the offseason, QB Scott McDonald, our Premier Division North QB of the Year has departed for Glasgow also, leaving the Oilcats to pick up the pieces somewhat. However the Oilcats have their talented Silvercats set-up to pick players from the infrastructure in place at Aberdeen is among the top in the flag league. 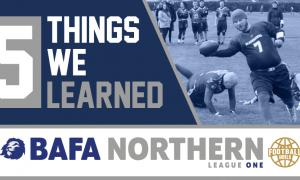 They’ve got solid coaching, an excellent development side and a history of success – we don’t think they’ll miss a beat and still strongly contest for the top of the division. Can we say “everyone”? There’s just so many interesting story-lines going into the year! The Broncos will obviously be looking to flip the script a bit, and the news that four teams from the Premier Division North will be going to the playoffs, on record, will give them a considerable boost. The MEC looks a fair bit weaker than last year, so they’ll be wanting to at their brilliant best at the business end of the season. With Fraser Thomson scheduled to return around the hunt for the playoffs, they could be an interesting one to keep an eye on. The Hornets and Oilcats will both want to maintain their significant success enjoyed the past couple of seasons. The Hornets will look to integrate their new toys into their team, while the Oilcats will be looking to plug the gaps left behind. Carnegie returning to the top table will be exciting, as they’re enjoying a real purple patch (get it?). However, they’re going up against three teams (Broncos, Oilcats and Hornets) that play similarly to the development sides from those football programs. Can they translate that familiarity into success? The Comets won’t want a repeat of last season. On some days they looked lost, while others they scored massive upset victories. With their kitted program going from strength to strength, we wonder if their heads will be turned by the contact side of the game. Edinburgh haven’t been mentioned much, and for good reason – they really haven’t done much of note this offseason. Recruitment wise they look to be getting new blood in soon, but it’s largely the same side that survived last season. They’ve undoubtedly got excellent talent, and that might be enough alone to keep them afloat. With Carnegie in flux, and the Comets potentially distracted with kitted football, the Outlaws’ stability could be key this season. Calum and Brandon formed a formidable duo in 2018. Calum joined up with the squad later, but by the time the playoffs rolled around, he was an absolute monster in his own right. These guys might just be good enough to keep Carnegie in the Premier division for 2020 and beyond; they’d make any QB look good. Luke caught our eye with an excellent display against the Aberdeen Oilcats last season, as he did an effective job in containing Gary Elliott, which is no mean feat. Since then, he’s impressed at Flagging New Year with some strong performances. With the Broncos looking to push for the playoffs, they may rely on Luke’s defensive prowess to keep scores low. The Oilcats have always had strong WR play, but last year Greg Sim managed to take over games as a WR #2. With Gary drawing some attention away, you’d be punished if you invested too heavily in stopping him, as it would allow Greg to run wild. The speedster put in an MVP worthy performance in the final of FNY as the Oilcats overcame the Hornets. With so much turnover at Aberdeen, they’ll need him to step up this year! Being specific in HNC predictions is often a recipe for disaster. Despite recent history, the top three sides know each other so well that they’re impossible to get right. The Hornets have the recent league history, but they’ll be stewing over that loss at FNY to the Oilcats. Similarly, the Broncos pushed them close in a one score game. What we’re sure of is that neither of these three teams are in relegation trouble, so no need to worry there. We’re taking all three of them to make the playoffs. Conversely, we’re predicting real trouble for the Outlaws and Comets. With the firepower on offence, we can see Carnegie staying safe. The Comets are our tip to go down if they have a similar year to last year. The level has gone up, so they’ll need to keep pace if they want to keep their head above water. The Outlaws and Carnegie had a tight friendly game recently, where Carnegie held a slender lead at the half. The second half was a blowout for the Outlaws, but with a pretty much empty bench, we won’t read too much into Carnegie’s collapse. The Outlaws might find themselves in a relegation play-off match at season’s end if Carnegie can adapt quickly.